When good friends of ours had their first baby two months ago, we decided we wanted to get him a less traditional gift but something that would be meaningful and last him a long time. 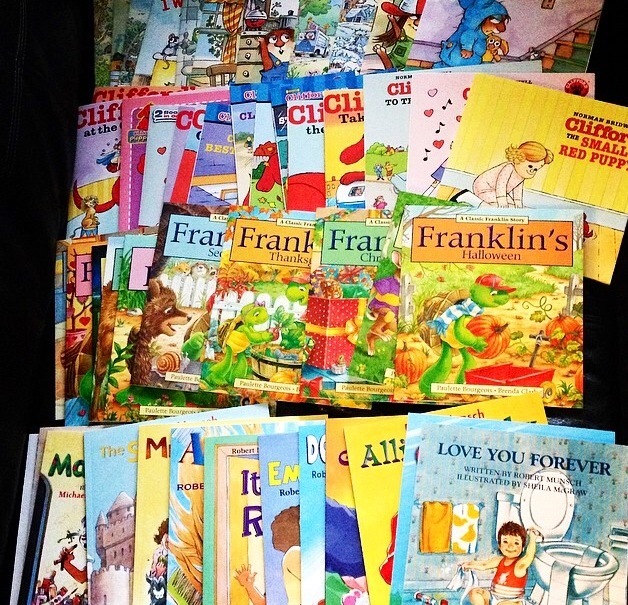 His mom loves to read, so we decided to start him off with a good collection of the classics: Franklin, Robert Munsch, Little Critters, Clifford and more. We presented them this past weekend and his parents were so appreciative. Being a book worm myself, I love knowing we might help make him a reader. He is such a sweet little boy. My business cards came in! I love the way they look and I’ve gotten a lot of compliments so far. I’m glad I actually have something to pass along in the future. My traditional birthday meal of Moxie’s Enchiladas and a Peach Bellini happened on Friday and it was perfect. My company was lovely too. A rainy coffee chat yesterday morning with my old roomie. My Main Taste Tester and his parents are hosting an early birthday supper for me on Tuesday. I feel very grateful that they are putting in so much effort for me. I’ve been kept in the dark about details and I love surprises so I’m really excited. We leave for Calgary in the wee hours of Thursday morning (my actual birthday). My MTT is the best road trip buddy ever and my sister and her boyfriend haven’t been to Calgary in years so we have a lot of fun planned. I can’t wait to spend a few days with some of my favorite people in the world.